At Captain Moe’s Lucky Fleet, we are conveniently located in Old Town Key West, right in the Historic Seaport District. We’ve been here for the past 30 years! Our fleet consists of three well-maintained boats, all of which you can charter for the experience of a lifetime. Anyone who fancies themselves a fisherman, no matter how experienced or inexperienced, or would like to give the sport a shot, should feel free to step aboard one of our boats. If you’re up for the challenge, shark fishing in Key West is an entertaining experience that you’re sure to remember for the rest of your life! Hammerhead Sharks – Hammerhead Sharks are unique due to their powerful bodies, which the species uses to fight. They are relatively rare to find and tend to be between 6 and 12 feet in length and up to 700 pounds. Tiger Sharks – Tiger Sharks get their name for their thick, vertical strikes along the bodies. They have earned a reputation for attacking fishermen and swimmers alike, so be wary of these deep-sea monsters. Lemon Sharks – Lemon Sharks are yellow-colored and the main reason why so many fishermen focus their efforts on catching sharks. They are common all year-round and reach up to 10-feet in size. Bonnet Head Sharks – People often mistake these small sharks for Hammerhead Sharks due to their shovel-shaped head. The Bonnet Head Sharks weigh up to 20 pounds and average between 2 to 5 feet in length. 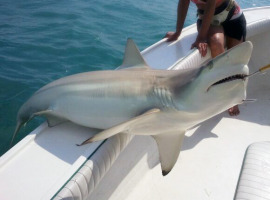 If you’re interested in shark fishing in Key West, trust Captain Moe’s Lucky Fleet for the voyage. Give us a call today at 305-304-8065.